Despite the horrendous weather during the show, Plantworx 2017 was a huge success for us and it proved to be our best exhibition yet. We were also pleased to have won the inaugural Paul Bidwell Memorial Award to accompany the award for Best Outdoor Static Stand which we won in 2015 and the Best Live Demonstration won at the 2013 exhibition. Plantworx 2019 is ‘The UK’s dedicated working construction event with a showcase of Plant, Tools, Equipment & Services’ and is Free to Visit with Free Parking and fully packed with 3 Days of Live Demonstrations. 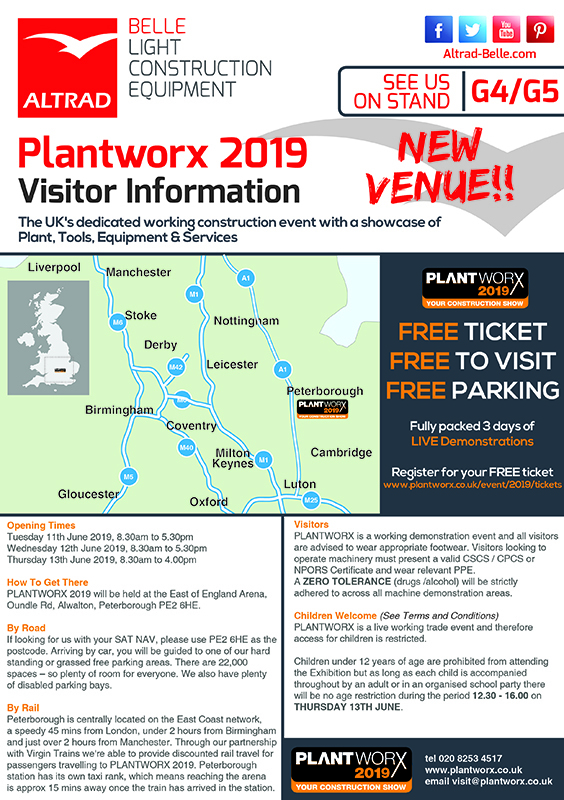 For the 2019 exhibition, Plantworx has a new home. The exhibition will take place at the East of England Arena and Events Centre (EEAEC), on the outskirts of Peterborough for 3 days between the 11th – 13th June. There will be plenty more updates from us over the coming weeks, with information on exciting NEW products ranges, ‘Show Only’ deals and a blog to capture the trials and tribulations of our stand build. We look forward to seeing you all at Plantworx 2019.